Entering the real estate scene is probably one of the most challenging business feats an entrepreneur still new to the industry would ever dare to take. It can be especially difficult for those who lack people skills as it is an industry which involves a lot of speaking to and meeting people face to face, discussing options, possibilities, and opportunities that the market can offer. It’s safe to say that having enough courage and confidence to be for and with people is usually a requirement in being a real estate investor.You may also see agreement samples. You can make or break a deal depending on how well-rounded you are when it comes to your knowledge in investment property. Being successful as a real estate investor takes time, the drive to learn what you can, especially about market changes and trends and real property ownership as well as leasing rules on top of learning how to make wise investment decisions. You may also see sample general partnership agreements. While you, like many others, may not be open to the idea yet as a new investor, the answer to such dilemmas are real estate partnerships, and if you’re serious about staying and surviving or growing in the industry, at some point, you’re going to engage in a real estate partnership. 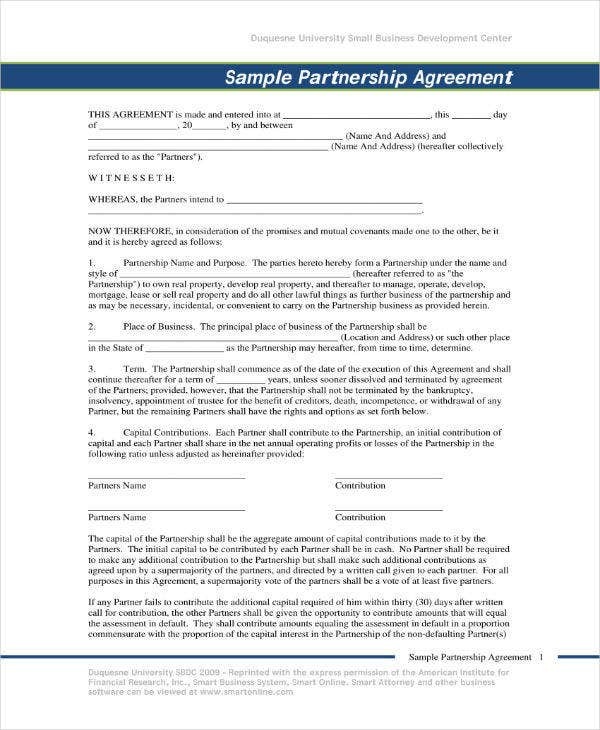 You can also read sample partnership agreements. Finding the right partner is hard to come by but if you know where to look and have the proper documents to back you up when you’re ready to make a deal, an investment property partnership may just be the stepping stone towards greater opportunities in your real estate business. Much has been said about strength in numbers and building a winning partnership with someone in the business that’s just as hungry for success as you, is one of the fastest ways into having an investment portfolio that attracts only the best people to do business with, which is what you need in achieving your long-term goals for your company. 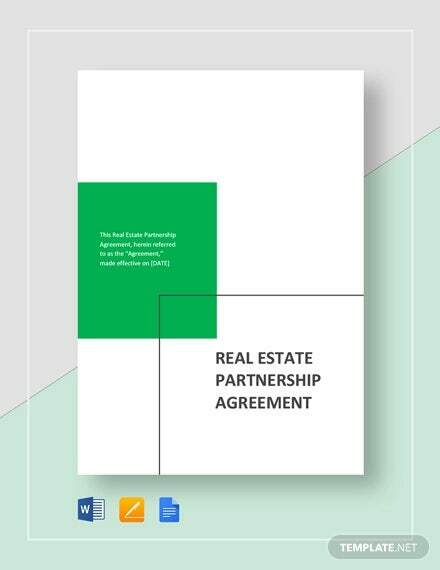 You can also check out business partnership agreement templates. A well-thought and well-balanced real estate investment partnership offer a great advantage for investors since they can provide not only a broader analysis and knowledge, skills, and network but also moral support when the going gets tough. You may also like partnership agreement templates. For those looking to expand their business or just try to get it off the ground, investing in tandem with an individual or another business with goals that are closely related to yours, someone you can trust and work with, can help you gain leverage when properly done and with each party having a good understanding of what their agreement entails. Advantages would include significant tax benefits and a great chance to increase capital. You can also read business partnership agreement templates. Investing in the real estate business would mean you’ll be entering a partnership agreement sooner or later. 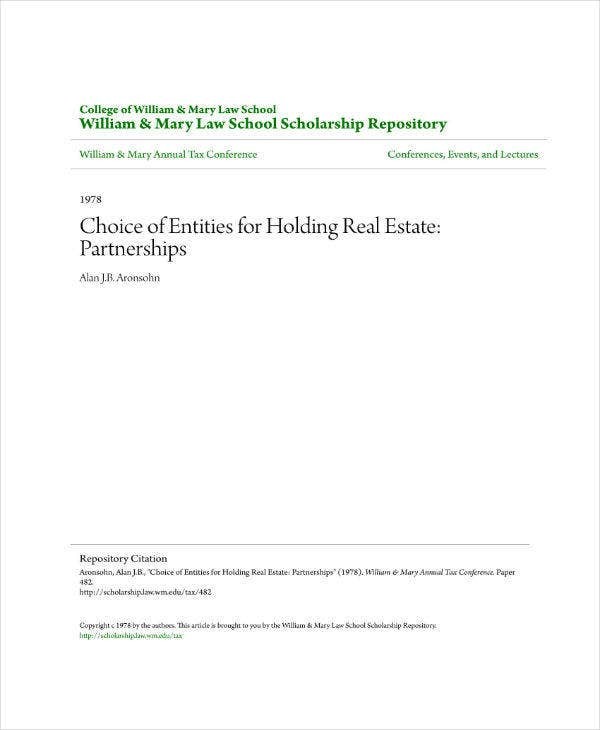 Such partnerships can benefit both parties because they give you an opportunity to pool resources and capital, including the sharing of overhead costs and the responsibilities that come with real estate ownership or management. It would also mean you would be sharing profit and income from the investment return you’ll be receiving, thus a partnership agreement would need to be put in writing and formalize each party’s rights and obligations and limitations. A real estate investment partnership, that is, one that has all the correct parts in place would have the capability to bring an investor’s career to the next level. This type of business partnership would also be a good opportunity if only for an entrepreneur to seek assistance from another investor in an area of business where they can use all the help they can get. It is however very important to remember that working alongside with another investor will only be good for all parties involved if they can commit it for the duration of the contract ad if they take the necessary steps as well as lay the foundation for a fruitful career together. A real estate business partnership is also inherently symbiotic in nature. Every last part of a whole is equally as important as the next, which means thriving real estate business partnerships are those that are made of two people who work with diligence and make sure that everything is in its proper place before taking one step forward. You may also see simple partnership agreement templates. When two people of different backgrounds, with different philosophies about business, come together, there’s bound to be an explosion of creativity when they are on the same page and see things the same way. But finding out 4-6 months into a partnership that the partner you chose to work with, does not see things from your direction can cause a lot of trouble with your investments. 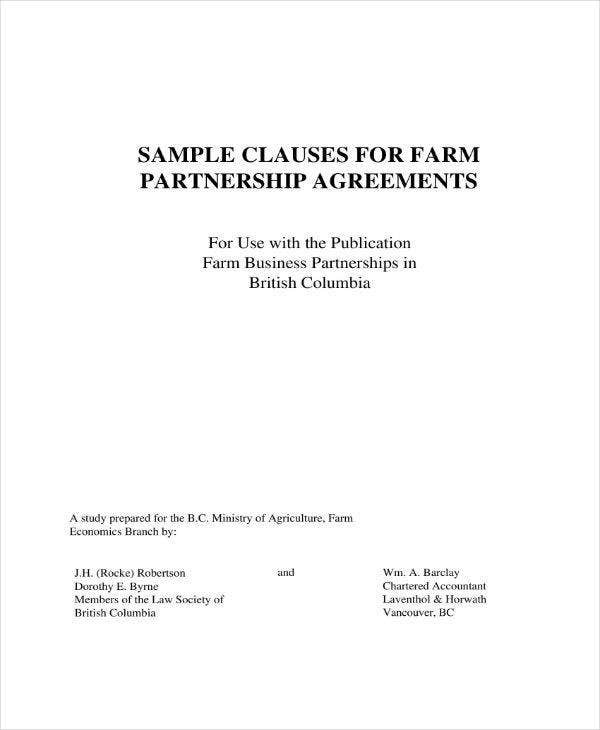 You may also see limited partnership agreement templates. You have to make sure that your partner is someone you’re able to communicate and make good decisions with. Being clear about where your strengths and weaknesses lie will put everything on the table from the start and no matter how brutal and difficult this process may seem at first, it will definitely help build a solid ground for your investment property partnership. 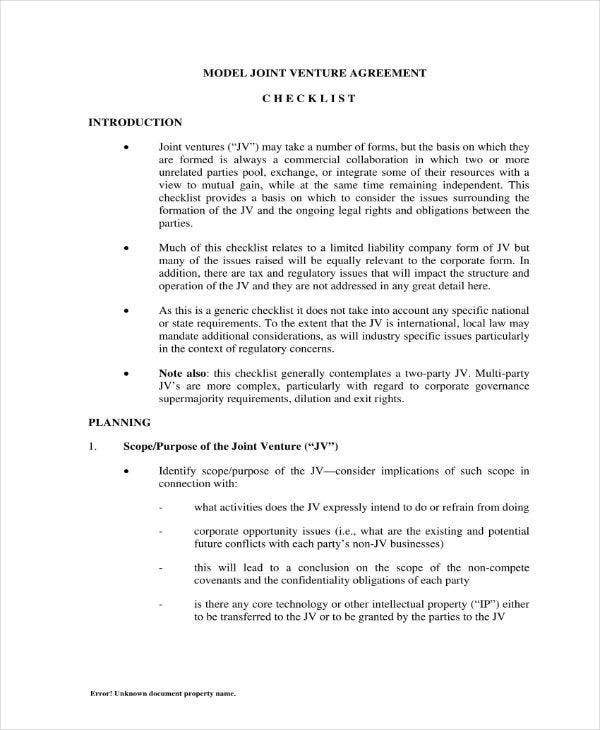 You may also like joint venture agreement templates. In order for the partnership to be effective and meet the purpose for which it was formed, each party must play realistic roles if only for clearly laying out each partner’s responsibility or each one’s part of the deal as it is important to set things clear before anything is finalized and before anyone commits to anything he may regret later. At this point, it is absolutely necessary that every partner has a clearly defined role in the business moving forward. You can also check out partnership agreement templates for restaurants. 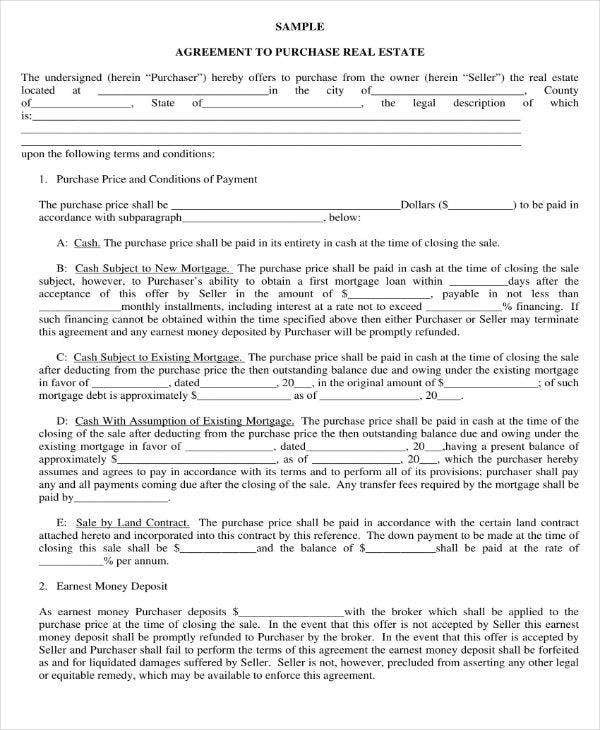 Whether you’re purchasing a piece of real estate or a big part of it with someone else who wants to make the same investment, you should make sure the transaction comes with signing an official contract, usually called a real estate partnership agreement, outlining the rights and responsibilities of all parties involved in the transaction. You may also see operating agreement templates. 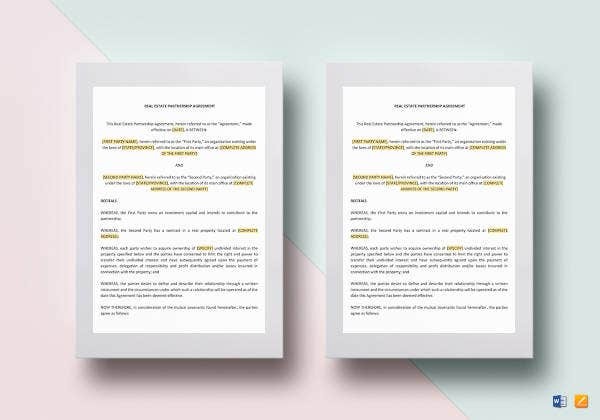 Agreements or documents like these barely make room for confusion or misinterpretation in case of disputes over fraud claims or the right to sell and process for early termination as well as proper allocation for rental income or when on suffers from investment losses. It also helps in having a clearly written record when it comes to property management, decisions, construction, equipment and remodeling costs. You may also like real estate purchase agreements. It’s pretty obvious that what makes up one of the most crucial elements of a partnership contract is each partner’s contribution to the property. Whatever either partner brings to the table in making the transaction go more smoothly should be properly accounted for and stated in the agreement. The most common real estate contributions for investment include cash on a purchase, a previously owned property for development services and construction projects or brokerage. Writing down each person’s contribution on a list encourages the proper establishment of ownership percentages when the time comes for dividing income and returns. As with any investment, and even with two heads working rather than one in trying to make wise investing decisions, real estate could give you positive or negative returns. Profits may come from rental payments and sales proceeds. On the other hand, profit losses may stem from a decline in the market itself, loss of property, or damage to property amenities. You may also like sample real estate confidentiality agreements. Having a real estate agreement will set the terms for how these returns should be divided. Most of the time this will depend on the partner’s ownership percentage developed from contributions made. Then again, you’re also allowed to divide the returns in a different way, especially if one of you is more involved in the management and maintenance of the property or properties. You can also read real estate confidentiality agreements. The division of duties and responsibilities should be written in detail. Ownership and management of a real estate property take a good deal of responsibility and each party should list the duties and obligations you have agreed to. Clearly, indicate who should take care of what or who’s obligation is a certain task to minimize the possibility of a conflict. You may also check out development agreement templates. Usually, real estate property management responsibilities would involve finding tenants, paying for maintenance, utility bills, coding, and taxes, getting in touch with customers or present tenants, supervising construction and remodeling as well as negotiating with vendors, suppliers, and other contractors. The sample real estate business is after all, about building trust and good relationships with both stakeholders and other people in the business, and even to some extent, your competitors. It’s a skill that can take time to hone but isn’t that difficult to build when you’re determined to learn what you can about the industry and when you know how to build on your success through partnerships with other investors.